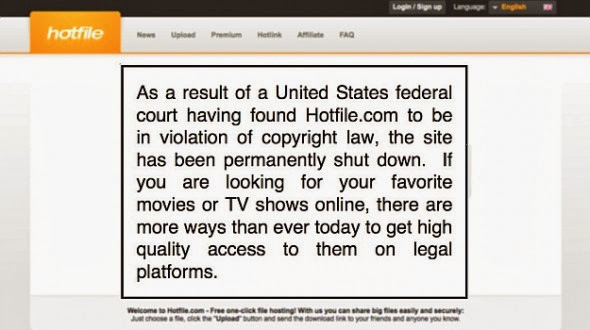 MPAA movement has brought about yet an alternate significant file-sharing site shutting down. Hotfile was a crappy site, actually, I never liked that site. The site used to give damn slow download speed and doesn't even provide download through manager until the user is registered and a premium user. There are many files I need to downloads like ROMs, some applications, softwares, kernels etc. and some people upload them at Hotfile for getting money but they don't understand the feeling of customer. Anyway, I'm happy with this because from now, everyone will go for MediaFire, ZippyShare etc. which provides hotlinking, download manager support, fast download etc. Credits goes to me for editing the image and capturing it. Not at all like a percentage of the bigger sites the MPAAand RIAA have followed, Hotfile didn't precisely have a stellar track record when it came to copyright takedowns. Prosecutors guaranteed that more than 10 million demands had been sent to Hotfile soon after the claim was filed in 2011 and that just 70 client accounts had been ended accordingly. That is not the sort of vigilance that keeps the Copyright syndication off your back. Also, Hotfile offered Money-per-download which makes users to upload more pirated tools or software which resulted in more downloads and more money. More than 50% of uploads in Hotfile are pirated things or cracks only. There was a dispute between MPAA (Motion Picture Association of America) and HotFile about some legal issues that was settled up with a deal of $80 million. Also, the Hotfile has been closed by the order of Judge because had already ordered to close the site because Hotfile wasn't qualified for Dmca Safe Harbor security, so net week's trial might have been kept tabs on dealing with the aggregate bill for dama. There's also a rumor that Hotfile will be working after some months but I wish it to be closed for ever!! The users will upload their files on MediaFire, ZippyShare, Dev-host and other sites which will make users to download them easily without waiting for some seconds or minutes [or instant download]. Users can download from IDM/FDM or other Download Manager after the users upload the files on other file sharing websites. The users money left behind! Hotfile took their shares with them only and didn't paid to the uploaders, so it's sad for the HotFile users. The users premiem account gone into vain! What about 1 year premieum account of uploaders? It is worst for the users who registered just 1-2 months before the closing of the website. Hofile took the Hot Files with them only! The users also might have made a backup of their folder or precious files which they cannot download or restore now! Sad for them again.